Golf breaks Eastern Europe, Eastern European Golf holidays & Golf weekends in Eastern Europe. Eastern Europe, with its buzzing capital cities and renowned nightlife, is the perfect place for a golf break with a party atmosphere. Eastern Europe is rated 5.0 out of 5 based on 3 verified reviews from YGT customers. They played and stayed (we even checked they signed their scorecards). For stag parties and larger groups, why not combine a few rounds of golf with some eastern debauchery? 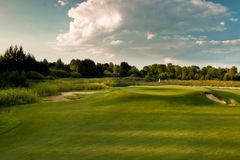 The cities of Prague, Riga, Tallinn, Budapest, Krakow, Vilnius and even Moscow are the ultimate golf and beer destinations. These fantastic cities have awesome nightlife, offering great value that is perfect for big groups. Our golf adventures and stag parties to Eastern Europe can be packaged with a huge variety of activities and outings - hunting, karting, shooting and escorted tours are just a few options open to spice up your trip.